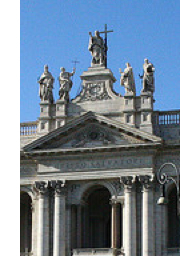 Today, we celebrate the dedication of St. John Lateran, which is the mother church of the universal Church. Most of us can’t be in the Lateran Basilica today, but we join in the celebration because we’re in union with our Holy Father, whose cathedral it is. Many people would think it funny that we celebrate the dedication of a building centuries-old and thousands of miles away. They would also think it funny that so much time and money has been spent on Sagrada Familia. Yes, the beauty of our churches and chapels is, indeed, gratuitous—that is, not necessary. But God’s love for us is gratuitous! His mercy is gratuitous! The fact that we even exist is gratuitous! So, the fact that beauty is unnecessary doesn’t mean that we shouldn’t bother with it. Instead, we, who are “temples of the Holy Spirit,” become more beautiful and more pleasing to God precisely by our gratuitous acts of charity. Mother Teresa famously encouraged us to “do something beautiful for God.” Today, let’s do something gratuitous for God. It may not mean the building of a basilica, but it will certainly mean the building up of the temples of our own souls.